Our 40-foot Ocean Alexander sedan was cruising at about 9 knots, transiting a notorious section of Lake Michigan known as Gray&apos;s Reef, when the weather started deteriorating. Lightning flashed wildly on the horizon, seas churned, and visibility fell to near zero. As a former Coast Guardsman with a great deal of heavy-weather experience, I knew how to prepare, but this front really had my attention. My wife, Mary Jo, arrived at the helm with our life jackets when the squall hit us with full force. Steering our bow slightly off the wind, Jenny Jo&apos;s 28,000 lb. almost immediately rolled over onto a 30-degree wind listvery dangerous stuff. Violent seas built within minutes. I watched compass headings and how the helm was responding. The wind was at 60 knots and gusting higher, and we were rapidly running out of deep water as we made our way toward the reef, taking boarding seas. I was uncomfortable with our limited options. Just as Mary Jo put her hand on my shoulder and shouted some reassuring words above the screaming wind, conditions began to improve. It had been the worst series of squall lines we&apos;d experienced in over 40 years of running big boats. Relief filled the cabin as we started mopping up water that the wind had driven through the top of the helm door. The lack of space and visibility around the helm had troubled me. It wasn&apos;t the first time I&apos;d wished for a pilothouse trawler with the superior handling characteristics of a deep-keeled, single-screw design and a large centerline rudder. As a delivery captain, I&apos;d piloted that type of vessel on several occasions and considered it the best choice. At that moment, the final decision was made: we would try to find a pilothouse trawler. A couple days later, we were cruising along the beautiful rocky bluffs of Door County, Wisconsin, on our final leg home to Sturgeon Bay. I was on the bridge, but I learned later that my wonderful first mate was shedding tears in the galley below. It would not be easy parting with this beautiful, award-winning boat that we&apos;d put our heart and soul into restoring (see "Elusive Dreams," PMM March/April 2000). The other challenge would be getting the appropriate return on our investment, which substantially exceeded published market values. What we hadn&apos;t fully anticipated was the exposure that PMM has to the world of serious mariners. Within 30 days of placing our first "for sale" ad, we fielded more than 50 serious calls and had two couples fly in from the East Coast and another drive up from Chicago. All arrived at our doorstep with the feature stories on our boat in a folder; they&apos;d been pre-sold. We had three pending sales at full price, one of which was finalized, and the new owners were thrilled. After removing our custom name boards, they renamed their boat and were off on the Great Loop. That winter, the hunt was on. We figured in a tough market we could search coast to coast and come up with some great options. It turned out that it was going to be hard to find anything remotely affordable. It seems that owners of the best boats tend not to sell. When they do, the price is high and the sale is quick. As is true of most veteran cruisers, we had some absolute requirements. 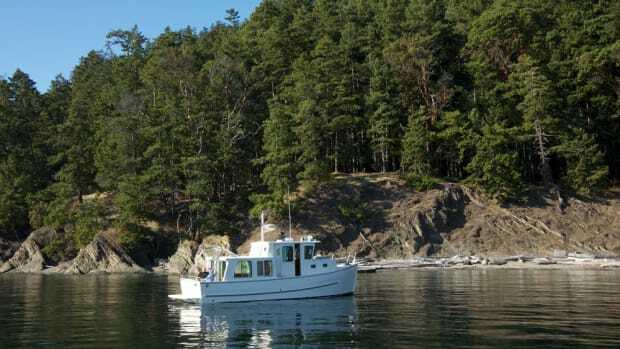 We wanted a rugged, high quality, traditional-style pilothouse design between 35 and 40 feet. For us, anything over 40 feet is difficult to handle and maintain, because we do most of our own work. And we find that larger boats don&apos;t allow us to get safely into some of the most spectacular little hurricane holes in the wilderness, some of our favorite spots. We would only consider single-screw diesel power, and we wanted simplicity of systems, excellent access and storage, and outstanding visibility from the pilothouse. The hull would have to be full- or semi-displacement, and we really wanted a freshwater boat. Our experience with our Ocean Alexander taught us that removing the results of salt water and salt air from a vessel is close to impossible. The next summer arrived, and it appeared we were going to be without a boat- not a pleasant thought. Then, out of the blue, I was offered an assistant harbormaster position at a wonderful marina in Fish Creek, Wisconsin. Some of you may be aware of the world-class vacation land that is Door County, Wisconsin; the Alibi Dock Marina in Fish Creek is at the heart of that beauty. With more waterfront than any other county in America, if you have to be landlocked, this is a great place to be. I took the job, figuring I would enjoy working around all of the boats for a season while we continued our search in earnest. Working with Harbormaster Marsha and interacting with all of the long-rangers that passed through our port turned out to be lots of fun. Krogens, Nordhavns, Selenes, Nordic Tugsthe list went on and on. I listened very carefully to what these experienced cruisers had to say about their boats, both pro and con. All of the many great conversations boosted my desire to get back out on the water. Somehow, one year turned into three, and then five, and we had all but given up on finding a freshwater boat. Unfortunately and surprisingly, the vast majority of freshwater powerboats found on the Great Lakes are not appropriate for any kind of serious cruising and were of no interest to us. The market was flooded with unsold examples of unstable, inefficient boats at rock-bottom prices. We finally found two nice boats in New England, but they were sold before we could get on a plane to go see them. The market value of high quality boats in our size range is stable, and they sell quickly. After about three years of working at the marina, we had decided on a 37 Nordic Tug. Two of them had passed through during those years, and Mary Jo and I both loved the functional layout. The owners&apos; enthusiasm, which was off the charts, further fueled our interest. I&apos;d delivered Krogens, and we had friends with Nordhavns, but for the type of cruising we wanted to do, we kept coming back to this one Nordic Tug model that had almost everything we wanted in a boat. When it comes to technology and sophisticated, state-of-the-art systems, we believe that less truly is more. Many boats seem to insulate you from the experience that brings you out on the water in the first place: real adventure, basic navigation, feeling and enjoying offshore waters. We wanted a very simple, functional, high quality boat, preferably over-built, by production boat standards. Also, for gunkholing the Great Lakes, we like Nordic Tugs&apos; deep-keel, semi-displacement hull. You can run comfortably without active stabilizers, and you have the option of just a bit more speed when needed to handle the steep, short seas found on the lakes. The hard chine makes the boat more stable at anchor and minimizes roll. Of all the Nordic Tugs models, we feel the NT 37 is the one with the sweetest running hull, and her beautiful sheerline is reminiscent of a lobsterboat. But how to find one? We seriously considered a new boat that the Nordic Tugs Great Lakes dealer had at a Trawler Fest event, but we decided against it. We wanted the mechanical Cummins engine and many of the features that had been eliminated from the new boats, so we pressed on. As we approached 60 years of age, we began to wonder if it was just not to be. Maybe our boating days were behind us. In the middle of my fifth season at Alibi, I was in the office preparing for the arrival of a long list of transients that would fill us up for the holiday week ahead, when the radio crackled to life with a request for overnight dockage. I politely advised the skipper that we were full as the boat appeared around the point outside the marina. "Are you sure you can&apos;t find a spot for a 37-foot &apos;trawler type&apos; for one night?" she asked. Those were the magic words. We always held one slip for emergencies, and, to me, making room for a beautiful 37-foot Nordic Tug qualified as an emergency. The owners, Art and Ronnie, turned out to be delightful, and they invited me aboard to take a look. I jumped at the opportunity. After an extensive tour, Art commented that I seemed really interested in his boat, so I shared my experience with him. "My wife and I have been considering selling at the end of this season," he said. I was floored, and my response was immediate. I asked him to discuss it with Ronnie overnight and said I would be back in the morning for another look. I didn&apos;t sleep that night, and when I greeted Art and Ronnie in the morning, I heard the words I had been hoping forthey were going to sell. Mary Jo and I went out with them for a two-hour test run on Green Bay the following day. The boat was flawless. When we returned to the dock, I asked Mary Jo what she thought. "If you don&apos;t buy it, you&apos;re crazy!" she said. That was all it took. Mary Jo loves the water as much as I do, and we both felt it was now or never. We needed to get back to what we so enjoyed together. By the next morning, we had a deal. After a multiyear, coast-to-coast search, the right boat had shown up at our own harbor. It was meant to be! Almost exactly what we&apos;d been searching for, hull number 39 was a 2001 NT 37 that had never seen salt and had enjoyed indoor, heated winter storage since new. We arranged to pick her up in Michigan that fall, after my commitment at Alibi Dock had been fulfilled. The next couple months were filled with all of the anticipation that many new boat owners feel. We could hardly wait. Wanting another crew member for the delivery, I called Bud Wheeler, a dear old friend and boating buddy from way back. After telling him what we had in mind, he hopped on the next plane out of Arizona to join us for the maiden voyage. The next few days went by in a flash as we loaded all the gear we&apos;d brought from home and finalized everything for departure from Michigan. About the last thing I wanted was to have tough weather to deal with on our first days with a new boat, but that&apos;s exactly what we had. There were small-craft warnings and strong winds from the east. We decided to run north along the Michigan coast from Muskegon to Frankfort, under the relative protection of the mainland. It was a cold, nasty day, but we were running in bone-dry comfort and total protection in the pilothousedefrosters breathing warmth on clear windshields, Bud and I sharing laughter, and Mary Jo comfortably nestled in the saloon behind us with a favorite book. The first day went well, with all mechanical and electronic systems performing as they should. Day two would be another challenge. The wind was even stronger, and small-craft warnings were up by dawn: a troubling sign. We would be dealing with an ever-worsening sea state as we worked our way offshore to the west. Since Bud was new to big water, we wanted him to assure us that he was OK with it. He said that as long as I was sure we were within safety limits by my standards, he was good to go. He trusted his old friend&apos;s experience and was already confident in the boat, as was I. Although we&apos;d had more than our share of operating under small-craft warnings, even gales and full storms, it&apos;s never an easy decision to head out in those conditions. The next couple of days were going to be much worse, so we slipped our lines early and cruised into a dark horizon full of building whitecaps. If not for that first day&apos;s run, I would not have been confident enough to go in an unfamiliar boat. But I quickly learned that this was an excellent hull and a wonderful little sea boat. Clearing the protection of Michigan&apos;s bluffs, we found very rough conditions. Bud was amazed at the whole experience and had found a position, wedged between the pilothouse seat and the chart area, that afforded him an exciting view of the wave action. And action there was. Being careful not to show my concern to the crew, I was unsure of how well we could hold our course in these large seas quartering off our stern. Those familiar with heavy weather on the Great Lakes fully understand that these are truly inland seas; it&apos;s the real deal when the wind blows out here. We were cruising at about 9 knots, disappearing in the troughs, and in spite of my best efforts to stay behind them, occasionally surfing over 16 knots down the front of a rogue wave. I was very busy at the helm, watching every wave, keeping my finger near the "disengage" button on the autopilot, just in case. But the autopilot held our course. Lynn Senour had done a marvelous job with this hull, designing it for the waters of the Pacific Northwest. Jenny Jo tracked like she was on rails. The seas had one idea, and the large keel and rudder had another; therefore, the autopilot wasn&apos;t even breathing hard. Very, very impressive. The hull is actually close to 40 feet, with a very low center of gravity, and I was rapidly falling in love with the way she handled. Still, it was a comforting sight when we finally spotted the Sturgeon Bay entrance on the horizon, because the seas were building near our safe operating limits. As we surfed into the ship canal, we were all smilesit had been a successful crossing. Some of our cruising friends were awaiting our arrival, giving cheers and thumbs up as we passed by their marinas. We were so happy to be back in this wonderful world of camaraderie that we call boating. We worked our way up the protected shoreline on Green Bay for a couple hours, eventually arriving at Alibi Dock Marina: Jenny Jo&apos;s new home port. Later, we managed to squeeze in a late-season run to Fayette Park on Michigan&apos;s Upper Peninsula, but all too soon it was time to haul out for the season. We had several projects planned for the winter months ahead. First, I would replace the polished stainless plow with a new Rocna anchor. I also would add 200 feet of heavier chain and replace the single 8D house battery with four deep-cycle 6 volts that would be easier to handle. The people at Nordic Tugs were happy to help with tips, guidance, and parts. Our first big project was replacing all six plastic ports with the beautiful polished stainless ports that were now standard on the new tugs. After installing aft spring cleats and waterproof kayak brackets to the pilothouse top, I tackled the last really large project of the winter: installing an integrated boarding ladder. With projects complete, spring launch arrived, and our first full season was under way. Our early cruising had confirmed an efficiency of 34 nautical miles per gallon, along with all of the pleasure we believed a rugged pilothouse trawler like this would bring. June brought the first annual Great Lakes Nordic Tugs rendezvous, where we enjoyed meeting Paul Johnson, Nordic Tugs&apos; head of production, who was a font of interesting information. We enjoyed being able to personally thank him for building these great boats. The instant camaraderie at the event was really something, and even Emma, our faithful Portuguese water dog, made some canine friends. It was a joy from beginning to endwonderful people and terrific boats. We had completed an amazing journey in search of a pilothouse, and we couldn&apos;t have been happier.